An Indiana State University faculty member will speak at an upcoming national conference on operations and supply chain management. Ken Jones, a senior lecturer in the Scott College of Business, will present "Building a Culture of Passion and Engagement in the Classroom" during the upcoming Advancing Productivity, Innovation, and Competitive Success (APICS) conference in Pittsburgh later this month. Jones will discuss how to create projects and partnerships with companies and other external partners to teach students. His presentation, which will include information about collaborative projects his classes have done with Clabber Girl, the Terre Haute Rex baseball team, Union Hospital and Delta Faucet, was accepted by a faculty review committee and will be part of the academic program that occurs on the day before the formal opening of the conference. "I want to get the word out, this is what ISU is doing," Jones said. "We're really engaging our community business partners to bring real projects into the classroom, and give our students a unique experience, something they might not get at other schools." He incorporates projects with external business partners as a way to teach students elements of their coursework. The projects also teach them additional lessons not found in a textbook, Jones said. "They confront the students with somewhat ambiguous situations where they're not exactly sure what tools to apply initially, so immediately they're challenged with how to structure the project. How do they solve this company's problem?" he added. "Students, they just really seem a lot more passionate about what they're doing in the classroom." He decided to pitch the presentation to conference organizers because of the emphasis that Indiana State places on experiential learning for students and the opportunities that are available for ISU students in operations and supply chain management. He wrote in his presentation description that, while the field is one of the most "hands on" business disciplines, professors rarely teach their students through experiential learning. "I'm just trying to be an ombudsman for the university, for our faculty and our students, to tell our story," Jones said. "It's probably one of the easiest presentations I've ever had to pull together." 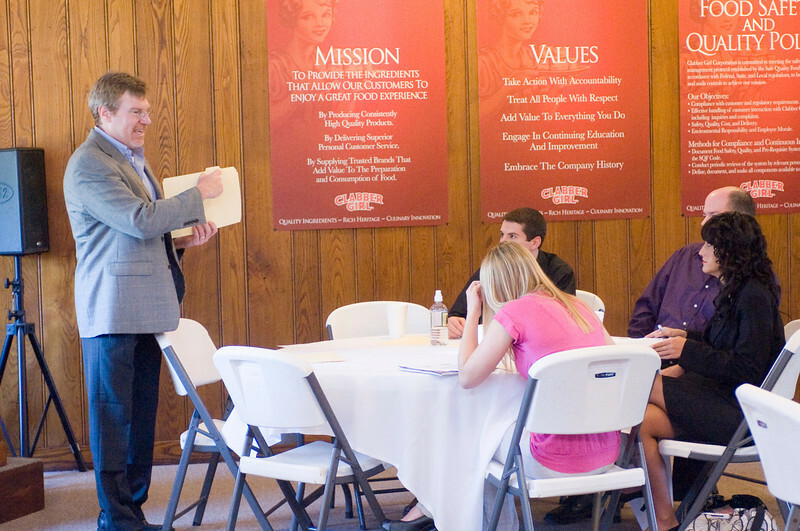 Indiana State University instructor Ken Jones talk to several students during a workshop about negotiations at Clabber Girl headquarters in Terre Haute. Jones organized the session with Kumi McGuire, purchasing director for Clabber Girl. The event was one of several projects created as part of "Project Clabberation," a joint initiative between ISU and Clabber Girl. Contact: Ken Jones, senior lecturer, operations management, Scott College of Business, Indiana State University, 317-413-6753 or kenneth.jones@indstate.edu.